On Wednesday, May 16th, Wake County EMS will hold the 6th annual Code Save Ceremony. Personnel from across the EMS System will gather to celebrate the 68 cardiac arrest saves for calendar year 2011. The ceremony will begin at 7:00 pm at the Fletcher Opera Theater in Raleigh. Mr. Bobby Barlow will give the keynote address. Mr. Barlow collapsed in cardiac arrest last November while giving a eulogy for a life-long friend. He survived and returned to his post-retirement job of setting up clients with home health care needs. Other entertainment includes; Acappology, NC State University’s outstanding capella group, Cairde School of Irish Dace, and a special recognition to honor and thank the 9-1-1 telecommunicators for their often under-appreciated role in EMS. It is with great pleasure that we announce Jefferson Williams, MD MPH has accepted the position of Deputy Medical Director with the Wake County EMS System. Dr. Williams completed his undergraduate and medical school at UNC-Chapel Hill, his emergency medicine residency at Harvard, and his EMS Fellowship and Masters of Public Health at UNC-Chapel Hill. He served with the South Orange Rescue Squad prior to medical school and has successfully published numerous book chapters, peer-reviewed research articles, and delivered scientific and educational presentations at the national level. We are very fortunate to have a candidate of this caliber as part of our EMS System. Wake County EMS will receive the 10th Annual Rosecrans Award on Saturday, March 3, 2012 at the EMS Today Conference in Baltimore, MD. The award is given to honor those in EMS who have gone beyond just responding to injuries-those who are preventing them in the first place. Wake County EMS Advanced Paramedic Program was selected for the incorporation of safety and prevention as core elements of an innovative , on-going program in the community. The Wake County EMS System is launching a unique training program this month for paramedics and EMTs that tests and emphasizes a variety of skills and abilities while in a setting that’s far more realistic than a simple class room. Wake EMS Professional Development staff have outfitted an ambulance with a “simulation manikin system” which EMS crews can use to drill on a myriad of complex emergency medical treatment scenarios. “Modern simulation technology allows paramedics to assess and interact with sophisticated training manikins. Changes in patient condition a variety of information, like vital signs, lung sounds and heart rhythms, are facilitated by a hidden training specialist using computers connected to the manikin,” says Joseph Zalkin, Deputy Director, Professional Development and Preparedness. The new system is a creative and efficient use of existing equipment and resources. The simulation manikin and computer system was integrated into an older ambulance that was scheduled for replacement. The “Simbulance” will travel to several points in Wake County to provide training and skills enhancement to on-duty EMS personnel. After positive field tests last week, the Simbulance will hit the road during the last week of February to meet up with EMS crews across the Wake County EMS System. Wake County EMS extends our deepest condolences to Durham Highway Fire Department for the loss of their member, Angus. Angus was a dedicated and loyal member of the fire department for 14 years. To learn more about Angus, click here. 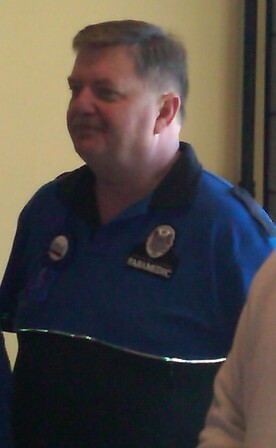 On January 25, 2012, current and former employees of Wake County EMS celebrated and honored Tim Edwards on his retirement. The celebration breakfast took place at the Farmers Market Restaurant with over 50 people in attendance. Tim started working for Wake County as a part-time employee in 1983. He was hired full-time on January 14, 1984. Tim was eventually promoted to Logistics Officer, serving in this role for 17 years. Tim’s EMS career also included serving as Chief for the Rolesville and Wake Forest Rescue Squads and winning the Wake County “Caring, Serving, and Respecting” Award for outstanding customer service. Tim officially retired on January 31, 2012. From the News and Observer: “Wake seeks federal grant to help lower medical costs”. For more information on Advanced Practice Paramedics, click here. The Raleigh-Wake 9-1-1 Emergency Communications Center is celebrating its 40th anniversary today. Mayor Nancy McFarlane has proclaimed January 12, 2012 the 40th Anniversary of the Raleigh-Wake Emergency Communications to honor this milestone. Since its founding in January of 1972, the center has rendered essential public safety communications that have substantially contributed to the apprehension of criminals, suppression of fires and saving of lives; not only within the City of Raleigh, but throughout Wake County and the participating municipalities. For the past 40 years when an area resident dialed 9-1-1, a trained telecommunications professional was ready to assist the caller and send the help needed. During the past four decades, the emergency communications center has seen growth in demand that mirrors the growth in the community. In the period between 2000 and 2010 alone, the number of emergency incidents dispatched grew by more than one third. Now, more than a million telephone calls are received or made by the staff each year. Over the course of its history, the Raleigh-Wake Emergency Communications Center has played an integral part in mitigating emergencies, both large and small. Included among the more noteworthy incidents are the crash of a commuter aircraft near Raleigh Durham International Airport in 1988, Hurricane Fran in 1996, the ConAgra explosion and fire in 2009, and the killer tornadoes of 2011. Severe weather events are particularly challenging as they directly impact the most citizens and place greater demands upon the center. Shortly before 1 p.m. today, Thursday, December 29, 2011, a fire broke out at Wake County EMS Station No. 3, located at 5303 Six Forks Road, Raleigh. The fire started in an ambulance that was parked in a bay and quickly spread to the building. All of the people inside made it outside safely and were not injured. The ambulance was heavily damaged and is no longer operational. The ambulance bay has significant roof damage and the living quarters have heavy smoke damage. EMS crews are being transitioned to back-up equipment and will be working out of an alternate location by close of business today. Fire investigators are evaluating the damaged ambulance to try to learn what caused the fire. Wake County General Services Administration will weatherproof and secure the building until further repairs can be made. Additionally, Wake County General Services Administration are evaluating similar models of County ambulances to ensure safety. During and following the fire there was no interruption to EMS service. The Wake County EMS System would like to welcome Dr. Jeff Williams to the position of Associate Medical Director. Dr. Williams officially started his duties on October 27th. Dr. Williams was born and raised in Matthews, NC outside of Charlotte. He attended college and medical school at UNC-Chapel Hill. While an undergrad, he volunteered as an EMT and rescue technician for 10 years with Orange Rescue Squad. After medical school, Dr. Williams completed his Masters in Public Health and trained at the Beth Israel Deaconess Emergency Medicine in Boston. Dr. Williams returned to NC and completed an EMS fellowship at UNC-CH. He is married with two daughters and also serves as the Associate Medical Director for the NC Highway Patrol.